Find us online for great rugby prizes and tickets. Naturally Passionate Glenisk is the Official Yogurt of the IRFU, standing #ShoulderToShoulder with the Men's and Women's Irish Rugby Teams to bring them - and you - our delicious, high protein yogurt. 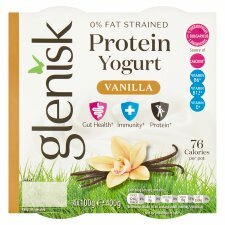 Glenisk is the Official Yogurt of Irish Rugby. We are proud to stand #ShoulderToShoulder with Ireland's Rugby Players - Men, Women and Young Players to bring them - and you - our strained Irish Protein Yogurt. Free from artificial ingredients, with twice the protein, the yogurt is a great choice for fuelling activity and post-exercise recovery. The distinctly Irish passion inspired by both the players and the supporters, alongside the pursuit of health and excellence makes Irish rugby a natural fit for Glenisk. Visit us at glenisk.com or keep in touch with us on Facebook, Twitter, and Instagram to find out how you could win VIP Rugby Experiences, Weekends at the 6 Nations Championship, merchandise and lots more rugby-themed treats. A Greek Style High Protein Yogurt made with fresh Irish Milk! Is Irish Strained Protein Yogurt like Greek Yogurt? We used to call our high protein yogurt Greek but not anymore! We're proud to tell the unique story of its Irish provenance. Glenisk's Irish Strained Protein Yogurt is naturally rich in protein, crafted and cultured over time in the traditional straining fashion on the site of our family farm in the heart of the Irish countryside. Authentic straining is an ancient yogurt making tradition, most associated with Greece and Iceland. While the Greeks may have invented it, it's the Irish who are perfecting it! Our special recipe uses almost four times as much milk as regular yogurt. Best of all, every drop of that fresh, nutritious milk is Irish, from cows grazing on lush pastures. Ireland's temperature climate and soft rains mean grass is plentiful and our cows are free to roam outdoors for most of the year. Extremes of temperature, such as those found in very hot or very cold countries, mean that cows must remain indoors for long periods. Ireland's weather is perfect for dairy. For Glenisk, this means a quality milk is transformed into a thick, nutrient-rich yogurt, high in protein and distinctively delicious. That you have chosen an Irish Strained Yogurt means you're assured of an exceptional standard of quality and you're supporting Ireland's farms, its rural economy and our natural environment. Thank You. Store between 0°C and 5°C. Use within 3 days of opening.